We have long been sounding the warning about free cloud storage services lacking security for your data. Sure, most people – especially the younger generation – do not care about security. They will eventually. Hopefully the catalyst to make them care will not cost or hurt too much. Many users start out using free cloud storage services like Google Drive and Dropbox for inane stuff that needs no security. But once they get used to it, the next thing they know they are uploading – maybe without even realizing it – data that should be protected. And SkyDrive? Well maybe it was an unknown before but with the advent of Windows 8 where Microsoft all but REQUIRES you to have a SkyDrive account and then – God help us – DEFAULTS to storing your data on SkyDrive (we have so many laws why is not one of them to prevent stupidity such as this?). Boxcryptor has both free and paid versions, we’ll talk about the free version because that will probably cover most people. Businesses obviously should opt for one of the (inexpensive) paid plans. 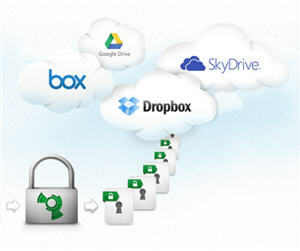 What Boxcryptor does is seemlessly work between your PC or mobile device to encrypt your data BEFORE sending it over the wire (or air) to your free cloud storage service – or even a paid service like SugarSync. The installation of Boxcryptor is pretty straightforward, with only one small glitch on the Windows 8.1 update that asks you to export some keys for the Windows EFS service; just do it and it should not nag you again. A service like this is all the more important as the free cloud services become more widespread – both by user demand and vendor insistence, like Microsoft is doing and even Google does to an extent. And we expect this vendor insistence to increase. Pre-encryption for cloud storage would not be worth much if it only worked on Windows PCs. Fortunately, Boxcryptor works on Windows, Mac, iOS and Android. Naturally, if you install pre-encryption on your PC and want to view those files on your phone or tablet you will have to install the same software, in the appropriate version, on your other devices too in order to decrypt it. The nice thing is that all this works in the background, you can still open a file as you normally would. It’s not like having a file in a TruCrypt vault or password protected zip file which takes other cumbersome steps to use. While it sounds good to have your data in the cloud, available from anywhere, remember the risks. Free cloud services owe you nothing, and have you read their terms of service, which they can change at any time? Thought not. And, the internet can – and does – go down. That’s why the PRIMARY copy of all important data should be LOCAL with cloud storage as an OFF-SITE BACKUP. Remember, no one cares about your data as much as YOU do, so use free cloud services with that in mind and take advantage of free pre-encryption from a company like Boxcryptor to keep your data secure. Filed under Free Cloud Storage and tagged Boxcryptor, Pre-Encryption.